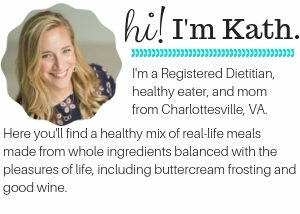 Hey, Kath Eats Real Food readers! 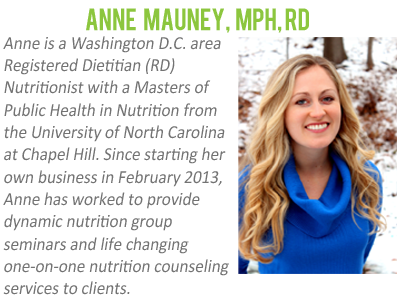 I’m Anne, a Washington D.C. area Registered Dietitian (RD) with an online-based nutrition counseling private practice. I’m also a health/fitness blogger over at fANNEtastic food, where I share quick and easy meal ideas and health tips, simple nutritious recipes, fitness adventures and running training plans, and more. A big thank you to my friend Kath for having me here today! I spent 5 years working in public relations and communications in the D.C. area before deciding to change careers and head back to grad school to become a dietitian. I now have a Masters of Public Health in Nutrition from the University of North Carolina at Chapel Hill, and a lot of my readers, friends, and nutrition clients have asked how my own diet (and by diet, I simply mean what I eat, not being on a diet – I don’t believe in them!) has changed since learning more about nutrition. Honestly, I tell them? I eat more fat. Part of the problem with the ratio of the two is that omega-3 fatty acids, which are not inflammatory, compete for the same enzymes as omega-6. This means that having too much omega-6 in the diet will interfere with omega-3 activity; several studies have shown that the biological availability and activity of omega-6 fatty acids are inversely related to the concentration of of omega-3 fatty acids in tissue. There are two kinds of long chain omega-3s associated with heart health benefits: EPA and DHA. These come from fish. The short chain fatty acid is called ALA and comes from plant sources, such as flaxseed, canola oil, walnuts, etc., but is not converted as easily to EPA and DHA in the body, in particular when omega-6 intake is high. So, where does this leave us in terms of everyday eating? Kath has it right – my #1 tip is to eat real food. Simply avoiding processed food will go a very long way in decreasing your omega-6 intake (due to the abundance of omega-6 rich vegetable oils in them), and will also greatly decrease your refined carbohydrate/sugar intake, too. Other tips? Eat fish, especially fish like salmon (favorites: Pesto Baked Salmon, Salmon & Vegetable Egg Casserole), tuna (try my Black Pepper Crusted Yellowfin Tuna), or sardines (here’s a simple way to make them tasty), which are higher in omega 3s. Think about purchasing grass-fed, instead of grain-fed, meat. Throw chia seeds and ground flaxseed into your favorite oatmeal, smoothie, or yogurt bowl to add omega-3s. If you like dairy, go for the full fat version, and savor it! Eat not just egg whites but the yolks, too, and enjoy the extra flavor and nutrients they provide. Enjoy nuts and seeds, and avocado, and even butter every once in awhile, plus anything else you might have avoided because you thought it had too much fat. And if you are going to buy packaged foods, check the ingredients list. The shorter, the better, and make sure you recognize everything on there, too. great article, anne. thanks for sharing! i’ve been eating a lot more fat since i had my son and i do find i’m fuller longer and that i feel and look good. i’m sticking with it! Anne, thank you for having the insight and courage to tell the truth. The author of an article I read elsewhere is a Registered Dietitian and therefore repeats the conventional wisdom on diet and health. The Academy for Nutrition and Dietics (formerly the American Dietetetic Assosiation) is funded by the food and beverage industry and big agribusiness. As such, official dietary advise is corrupt. This advice has resulted in a nation of obese diabetic people. Three cheers for “real food” RDs! Love the tips and information!!!!!!!! YUM! I love eating fish but hate preparing it. 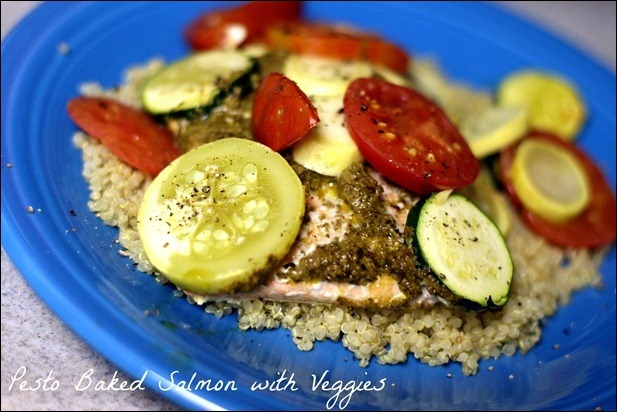 I bet salmon with pesto would be amazing! Thank you for posting this on healthy fats.. I feel like there is such a stigma surrounding fats when, in actuality, they’re SO good for you! Great information- I have recently switched to drinking 1% organic milk because I do feel more satiated after drinking a cup, and try to buy great fish and meats when possible. It is always so hard to know what is best because so many studies out there contradict each other in order to support one industry or another. Thanks for cutting through the muck and giving us clean information! Great information. I know some people are terrified about the idea of eating fat but it just isn’t as evil as people think it is. Plus, when you eliminate fats from food, it’s usually replaced by tons of other non-wanted chemical crap to make it appetizing. Very informative! Thank you, Anne and Kath. I have learned so much from this blog! Thank you again for having me here today, Kath! YAY love this! And love that it verifies that my higher fat diet isn’t a bad thing! What’s your take on olive oil? I know eating it (uncooked) is a big part of the Mediterranean Diet, and that some people recommend swallowing a tablespoon a day. Do you buy it? Also, thanks so much for including sources; I’m looking forward to checking some of those out. And thank you also for including some non-fish options for us vegetarians and vegans! I know that fish is healthy in many ways, but often feel disappointed when recommendations (especially for omega-3s) don’t include meat-free options. I was just wondering about this myself. I came to this post via your post from today, and I use olive oil almost exclusively for cooking and dressings (I also use canola for cooking and baking). I might have to mix it up though, walnut oil sounds like it would be good! This is the best post I’ve seen here all year. Informative, easy to understand, and well-researched. Yay! Awesome post. Incorporating “good” fats into my diet is something I’ve been concentrating on for the past year. Nice to know your take on it. Thanks Anne! This is excellent. Thank you for posting! Such great information. My weight-loss journey starting with upping my fats and lowering my carbs and it helped me learn how to eat sooooo much. I also didn’t feel super deprived. I love Anne’s blog and her theory on eating and exercising. LOVE that you have all the science to back it up! Great post, Anne! Really interesting post!! It’s fascinating how diet trends from the 1980s (which were probably based more on marketing numbers than actually science) can so heavily impact how we eat today. I’m a big fan of just eating a balanced diet. I don’t deny myself anything, but at the same time if I have a burger for lunch I probably shouldn’t have another for dinner! Yes, agree with this approach 100%! So great to hear a RD preaching the healthiness of fats! I’m definitely a fats lover – they keep me full longer & they’re definitely healthier than the carby crap most Americans eat. I don’t eat a lot of carbohydrates (and the ones I do are from vegetables, a small amount of whole grains and a little fruit), but I eat 40% of my diet from fats & I have fantastic lipid numbers, including a triglyceride level of only 45 (normal is under 150) and an HDL of 60 (females should aim to be above 50). Is there any way of balancing the omega-6 and omega-3 for vegetarians (do not eat fish)? Will fish oil supplement work? You wrote that flaxseed etc does not get converted to DHA and EPA easily so that made me worried. Also I deduce from the article that using canola oil is better than other vegetable oils in terms of omega-6 reduction. Is that true? HI Nikita! Great question. The jury is still out on whether fish oil supplementation actually is beneficial or not. My advice to you would be to increase the vegetarian sources of omega 3 in your diet. Regarding oils, canola is definitely a good bet, and is especially good for baking. For sauteing, I like using olive oil for flavor or coconut oil since its saturated fat stands up well to heat. For salad dressing or anything not involving heat, try a polyunsaturated oil like hemp, flax, or walnut oil for a boost of omega 3s! 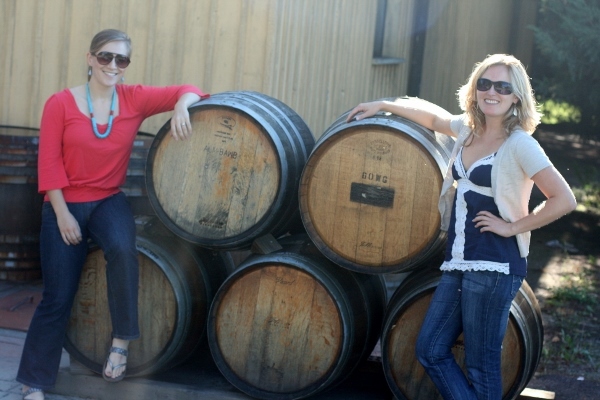 Overall – it’s good to mix it up, since different oils provide different nutrient profiles! Can you comment on the use of vegan diets to prevent or reverse disease? In your opinion is dairy a healthy food? Thanks for the post- very interesting! Vegan diets are absolutely a personal choice, and can be very healthy if managed properly (e.g. making sure to include enough protein from beans etc, and eating sufficient healthy fat like nuts, seeds, avocado, etc.) Some supplementation will be needed (B12, for example), but a vegan diet can definitely be healthy (and of course has many benefits related to animal welfare, and other causes). That said, I don’t think it’s necessary to be vegan for health reasons only, especially since the inclusion of fish in particular can have such health benefits. Regarding dairy, I eat it myself because I really like it, but I don’t think it’s necessary to health at all like the standard nutrition advice states. You can certainly get the nutrients elsewhere, and of course the jury is still out on whether dairy is good for us or not. For me, it’s worth it because I love it, but again I think it’s a personal choice. Hope this helps! I agree with this 100%! I feel like my parent’s generation is the hardest to convince of this. My family would rather eat low fat processed food than whole foods! Thank you Anne( and Kath) for continuing to educate consumers. As a fellow RD; I spend hours trying to increase awareness of the benefits of REAL food. This article adds ammunition to my teaching. Well said, Anne! Great, research-based, easy to understand article. So many people need to hear this! As a dietitian to-be (last semester! ), I’m always trying to find simple ways to explain this to family and friends who still stick to a low fat, highly processed diet. Thanks! 60% of my calories come from good fats… it makes my life so much easier – I feel great with 2 meals a day and never have to worry about having a snack with me at all times… because I don’t need one. Great read! =) will have to check out Anne’s blog!!! Great post! I have always avoided any diet or low-fat versions of food because I just didn’t like how they tasted. I seriously don’t understand how margarine ever caught on, blech! And 0% plain greek yogurt tastes like spackle to me. I love that I can savor the flavor of natural fat without feeling guilty. Thank you so much for the wonderful and informative post. I have one question: I don’t like the taste of whole milk, it feels like I’m drinking cream – so I buy 2%, which is what I was raised on. Is there any nutritional difference between the two? I don’t consume a lot of milk (not even on a daily basis; my husband and I go through a half gallon about every 1-2 weeks). Thanks! Doing what works for you is perfectly fine, especially since you are having 2% for flavor vs. concerns about fat. There’s only a small difference nutritionally – basically whole milk has 4% fat. So stick with what works! I often buy 2% as well as it’s my favorite, so I’m with you! I hear you, Anne! Awesome, informative post. I used to be a low-fat gal and still (sometimes) fall back into that mentality. My boyfriend is very pro- high fat/high protein and encourages me and others to eat REAL food. It’s great to have someone in my life like that to encourage me! Great article, but when you say MORE – how much is ‘more’? For example C:F:P ratio? I loved this post! I been really enjoying this series/style of post. thank you for the informative article, love it! Good fats are a girl’s best friend 😉 In may case, they wonderfully keep hunger at bay, add taste, texture and nutrition to my meal and, last but absolutely not least, give me soft and silky skin and shiny locks. Thank you Kath for hosting! I have heard that olive oil hydrogenates at higher temps, like sauteeing, so I was wondering what your thoughts were on that? I try to use avocado or grapeseed for sauteeing, but wondering if that’s right. Yes, you are right that some oils stand up better to heat than others! In general, saturated fat will stand up best to heat, so coconut oil is a great choice for really high heat situations like frying or higher heat sauteing. Monounsaturated oils hold up relatively well to heat, though not quite as well as saturated (but a lot better than polyunsaturated oils). Monounsaturated oils like olive, canola, avocado, and sesame oil can do well with lighter heat sauteing and cooking. I still use olive oil a lot for sauteing since I like the flavor best and we aren’t usually on super high heat, but it’s up to you! For salad dressing or anything not involving heat, try a polyunsaturated oil like hemp, flax, or walnut oil for a boost of omega 3s. I hope this helps! I love this post! Thanks to Kath for hosting, and for Anne for the post! I’ve finally found my “happy weight” after learning to listen to my body and increase my healthy fat consumption. I used to follow the low-fat diet craze (mostly just empty calories), but the minute I started eating healthy fats (olive oils, avocado, coconut butter and oil, nuts, seeds, more fish), I lost 5 pounds, had more energy and satiety than ever before, and my skin and hair went from dull to super shiny and healthy. Plus I read that our bodies actually need fat to absorb some of the minerals and vitamins in veggies, so yay for avocado! 🙂 Thanks again! when i first got into “healthy eating” myself (my family still ate pretty healthy, but i mean when i began researching/cooking), i’ll admit, i shied away from a lot of fats! now, i make sure to include them and especially with salads! i only like certain nuts and seeds though, so i gotta get creative. thanks for such an informational post! Would be honored if you linked to it! Thank you! Awesome post; hugely informative! Thanks, Anne! I really, truly want to hug you ANNE!!!! You and I have the same mind set when it comes to eating and I ADORE FAT! Adore it. It makes me sad when people say they eat low fat for their health… Makes no sense to me! 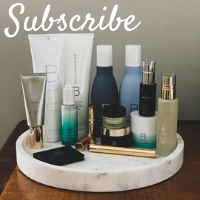 Great post and info – thank you! Would you do anything “different” from what you talked about if someone is pre diabetic? No, I wouldn’t! The importance of including fat (and protein) with carbs is even more important for someone diabetic or prediabetic as the fat/protein will slow the blood sugar surge from carbs. More fat will also usually end up meaning people eat less carbs, too, just because the fat helps so much with satiety. I too am a REAL food RD and loved this post, Anne! The past couple of years I was all about low-fat and probably took my eating habits to unhealthy levels; hence I was binging on dry cereal, crackers, tortilla chips whenever I could get my hands on them. I now embrace full-fat (in moderation) and will never go back! I just googled “healthy food blog” and Kath’s blog came up on a list of Top Ten. The blog world is new to me but I found this article so informative and helpful. I am a 53-year young woman craving knowledge to fuel my body. I am a member of a 12 step program for overeating. Now that my mental and spiritual issues have been addressed, I’m now full speed on learning how to properly feed my body. I have made great strides choosing real foods: whole grains, lean meats, greek yogurt, fruits and some veggies (still my downfall). I’ve added chia seeds, flaxseed meal, tried spirulina, eliminated most added sugars from my diet. I stay in the disease when I continue to eat sugar. I wish I could have a piece of cake but one piece unfortunately just won’t do! I also have become more mindful of my food and I truly now savor my food. It’s a joy! My question for Anne concerns calorie intake. I just had my BIA (not BMI) tested in a Bod Pod and my percentage of fat is 47.8. I fully realize that I have over 100 pounds to lose SENSIBLY! For a ‘low active’ level my Total Energy Expenditure is 2669. Subtract 500 calories from that, and I am left with 2169 daily calories for weight loss! I have NEVER ever been told to eat over 2000 calories to lose weight. Can you help me to understand the results? BTW my Resting Metabolic Rate is 1756. I am hypo-thyroid, post-menopausal and have begun increasing my activity with Zumba, some walking and recumbent bike. I plan on adding weight training. Thank you, Anne, for this informative article and to Kath for your blog. Welcome Suzy! The only way to see what numbers work for you is trial and error. I’d focus on whole foods (as you are doing) and not worry so much about the calorie level. Or keep a journal for a short amount of time to get a feel for how it feels to eat the right amount. See if you lose there and adjust accordingly. Best! Anne – it seems that instead of fat, sugar has become public enemy number 1 in nutrition. Sugar is just everywhere in processed foods and even show up in raw veggies. Are you recommending that people lower their sugar/carb intake given the recent studies showing a correlation between sugar and heart disease? I definitely recommend a decrease in processed foods, added sugar, and refined carbohydrates, yes. That said – moderation is important, and so is occasional indulgence! I eat a low fat diet but not because fat is bad. Fat got a bad rap because of processed fats which also gave saturated fats a bad name. The way the majority of meat is processed the fat content of meat is not healthy to eat. I eat a low fat diet but I eat saturated vegetable fats like coconut oil. Oh I also eat a plant based diet. I eat a high carb (good carbs like fruits – not junk carbs like processed grains) and low protein and low fat. I have been eating this whole food plant based diet for over 2 years. Yeah I have lost weight and gotten back to my weight when I was in my 20’s (I am 46 now) but that is not the most important thing. I haven’t gotten sick in 2years, not even a cold and that is the most important thing. Fat is good for you, but not all fat. Fats high in omega3 are good and fats high in omega6 should be used minimally. For me I don’t need a lot of fat. I am highly active, I box and run a lot, and being loaded with good quick burning carbs supports this lifestyle. Great post. As a physician I am always finding myself explaining these points to patients. Everyone is so scared of eating fat, yet we are all getting fatter. I am convinced that sugar and processed foods are causing the obesity, diabetes, and cardiovascular disease trends in our country. It is so broad that to me, this is even a bigger concern than tobacco. Love this post! I’m a first-year Nutrition student, and this totally makes sense to me. Such a good reminder to put the scientific research first, rather than the rumors that plague the Internet. Thanks for such an informative piece! Love fannestic food blog. She has it all! Fitness-food-reciepes for all sorts of good nutrition. I love just love her running tips/trips/info. with integrity. Her breakfast ideas are my fav. My go to to fuel my workouts is her peanut butter granola bar. I have been making these for my family ( freeze then fly to see them, these better be with me when I arrive at their door-as they really love these). This site has it all and is my favorite. I have learned so much about how to eat well. Really enjoyed this post, Anne!! What about those of us who have bad reactions to fatty foods. I try to steer clear from saturated fats and especially fried foods because it causes horrible acid reflux to flare up. What would you suggest for someone who wants to eat healthy fats but still feel good while doing it?